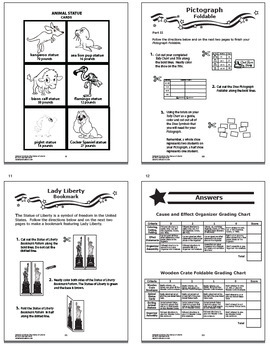 • Statue of Liberty COMPLETE Lesson – we supply all of the CONTENT! 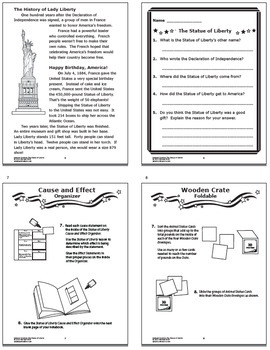 Students will practice Functional Text Comprehension by following written directions to assemble a Statue of Liberty Bookmark – step-by-step instructions and Statue of Liberty Patterns included! 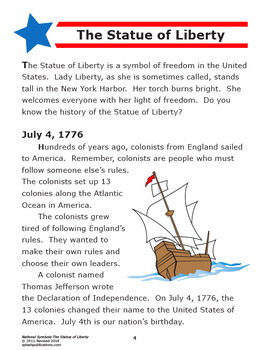 We've included a color version of the Statue of Liberty lesson for your White Board, black line masters for your students, Grading Rubrics for the Interactive Notebook Assignments, and Answer Pages. 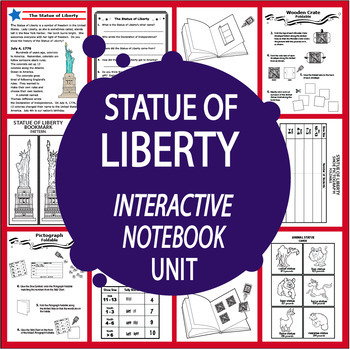 Please download the Statue of Liberty Preview to see samples from the Unit and activities. RATING THE STATUE OF LIBERTY EARNS YOU TPT CREDITS TO USE TOWARD FUTURE PURCHASES AND GIVES US A WARM FUZZY FEELING! (c) 2018-Splash! Publications. Permission is granted to original purchasers to reproduce material as designated only for classroom use. No other part of this work may be reproduced in any form or by any electronic or mechanical means including information storage and retrieval systems without written permission from the publisher, except by a reviewer, who may quote brief passages in a review.